So, now that The Fifth Season is out, I can finally talk more about the making of. Over at Scalzi’s I blogged a bit about why and how I chose to use second person, among other things. Now I’m going to talk about creating the Sanzeds, the orogenes, and the stone eaters. Anyway. Let’s get to it. But the Equatorial region’s people, the Sanzeds (they once had many nations, cultures, and languages, but have homogenized over the 3000 years of the empire) are nothing we would recognize. I did this partly to illuminate just how different the Stillness is; races on our world differentiated in response to environmental conditions, and since the environmental conditions in the Stillness are so different, it made sense that what we think of as racial markers would’ve developed along completely different lines. Which is why Sanzeds tend to be tall and physically imposing, having descended from generations of Mad-Max-esque warlords. A lot of those warlords were women, which is also why they don’t tend to have a lot of gender variance — that is, there’s not a lot of physical disparity between men, women, or other genders; they’re all tall, broad people. They have a propensity to be what we’d call fat; they’d call it “famine resistant.” Their skin is a shade of bronze-brown that can both handle intense equatorial sunlight during normal years and still produce sufficient vitamin D during Seasons. This isn’t stated, but they tend to be immune to some of the more common diseases in the Stillness, just as a number of peoples have developed immunities to common environmental threats in our own world. They have a natural hair texture (“ashblow” hair) that’s acid-proof, waterproof, thick enough to help retain heat over any body part it covers, and coarse enough to be used as a filtration mask against “concrete lung” during ashfalls. When the ashblow hair is gray, it aids camouflage during ashfalls. Hell, it probably makes a good floatation device, too. But in an early draft of The Fifth Season, I’d planned for the Sanzeds to also have natural color patches/blotches on their skin a la vitiligo or piebaldism, most prized when it appears on faces, but I later removed this. I was already worried about readers seeing the Sanzed as Pacific Islanders, given the “island” associations that we have with equatorial civilizations in our own world, so I thought the facial markings would sound something like Maori ta moko. Facial tattoos for the Maori have a sacred purpose, and I wasn’t interested in appropriating any real people’s real traditions. The goal was to make something new and plausible, not to slap a bunch of random real-world traits and stereotypes onto this created people. Hopefully that worked here. Technically it makes no sense to call this a race at all; they emerge from every people of the Stillness in roughly equal proportions, though more of them live to adulthood in the Arctics and the Equatorials because the Fulcrums are located in those regions. There’s nothing visually distinct about orogenes; the thing that makes them unique is perceptual, behavioral. Yet race in our own world is a social construct, not anything related to actual biology, so it makes sense that a world which has such complicated feelings about orogenes would conceptually fission them off from the rest of humanity. In fact, as Essun alludes at one point in TFS, Old Sanze officially classified orogenes as non-human a few centuries back. The better to oppress. But there’s also something about the common experiences of orogenes which lends some substance to the label. Orogenes of the Fulcrum use a highly specialized vocabulary — e.g. torus, crucible, grit. They aren’t used to hiding, which is one of the reasons it’s rare for them to successfully escape; having spent years among their own kind, there are markers in their behavior which make them stick out like sore thumbs among any non-Fulcrum population. Only those who lived outside the Fulcrum as children have much real hope of blending in. But orogenes who grow up outside the Fulcrum — ferals, as Fulcrum orogenes call them — have their own unique traits. They share the markers of an oppressed group in hiding — and just as black people can sometimes spot those who are passing via “blackdar”, and just as other hapas often know on sight that (frex) Keanu Reeves is One Of Them, it’s something that can be seen. It might be subtle, protective camouflage… but it’s visible to those who have reason to look for it. Essun, given her experiences, also demonstrates another trait common to oppressed peoples: she can code-switch. When she’s in hiding, she uses all the same protective camouflage as any other feral, but she can play arrogant, eccentric Imperial Orogene to the hilt if she feels the need. This is the group about whom I can say the least! I’m intentionally keeping them a little mysterious for now. People who’ve read The Fifth Season know the basics: stone eaters normally appear to be realistic statues of human beings, apparently carved from marble or other statue-stone, sometimes with added color. They most often appear to “pose,” motionless, though they are capable of movement — either stone-grindingly slow or instantaneous, with no in-between. They’re rumored to be immortal, indestructible, and unstoppable, and they’re capable of transiting through stone, either phasing through or fusing with it, very rapidly. When they speak, their voices resound from within the chest; they don’t use their mouths for that purpose. When their mouths are open, however, they have teeth of faceted diamond. They do eat stone — but their preferred diet, the specific type of stone they like best, is… something that will be explored more in subsequent books. 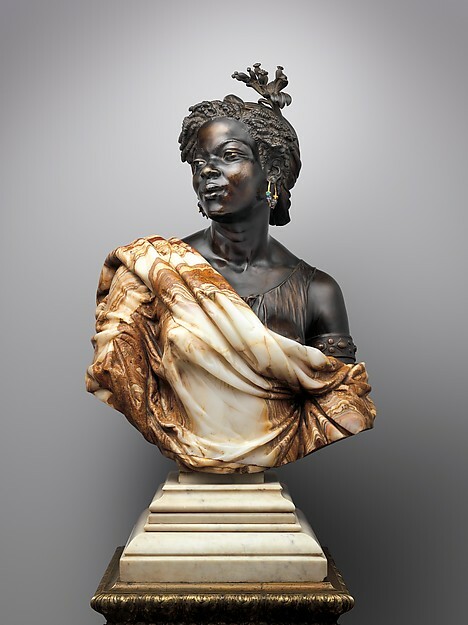 Capresse des colonies, Charles-Henri-Joseph Cordier, 1861. Now imagine her turning to you and saying hi. What I can say for now is this: the stone eaters are me playing around with the idea of mythological creatures. As they exist in most fantasy tales, mythological creatures cash in on existing cultural capital — that is, readers know what to expect because these creatures are defined by centuries of folklore. So readers know when they see elves to expect lots of magic, possible trickster behavior (“never eat anything a fairy gives you!”), ancient and complicated history, and so on. But while the people of the Stillness have heard many tales about stone eaters — some true stories and a lot of made-up nonsense — and the characters of TFS allude to a few of these tales, the reader doesn’t have that bank of cultural capital to borrow against. And then there’s the fact that the stone eaters aren’t “mythological;” they are in fact real people with real motivations of their own. So I tried to write the stone eaters as basically mythological creatures sans mythology, or regarding whom the mythology was all but useless. Usually when I see this in fiction, the creatures read as monsters. Without the cushioning effect of folklore, the creatures become too alien and frightening, or pitiful, to embrace as fellow people. I’ve seen other writers manage it, though, so here’s my chance to see if I can do as well. More on this later. In fact, more on all of these groups later. Just wanted to share some of the thought that went into them thus far! ETA some additional bits of detail, now that I’ve re-read this and have had coffee. ETA2: Decided to alter the line about “gaydar” to a mention of detecting passing/blackdar. Occurs to me that it’s better to stick to the axis of race in this case since I know that one well, rather than appropriate the experience of queerness just because it’s better-known. Better-known doesn’t mean it has the same context or mechanisms. FWIW, it never even crossed my mind to equate the Sanzeds with Pacific Islanders, given how vastly different the world felt. Thanks for sharing all this, Nora. I look forward to you telling us more. I love your worldbuilding to bits. I think you did a great job of making the stone eaters not so much monstrous as unknowable. Alien. And then humanised by one character in particular. I’d love to read one of these sorts of posts on gender as experienced and presented in the Stillness. I believe I noticed two trans characters, which thrilled me. I can’t really do a whole post on gender presentation in the Stillness. That wouldn’t be anything I’ve created, frankly. And there isn’t much to talk about. Tonkee’s the only significant trans woman in the story, though I think there’s a mention of one or two more trans men and women (or boys and girls) among the background/non-speaking characters. Everyone else is cis. Womanhood in the Stillness is measured by your ability to survive the apocalypse, but that pretty much applies to everybody, as I tried to show in the story. Not sure what else there is to say. Thank you so much for sharing your experiences and thoughts on world building! I’m new to fantasy writing and world building (though I’ve read a fair bit). I’ve got a few stories that are really pressing me to be told. So… I find I’m floundering with getting the basic world structure bits straight before I can really get to tell the story. I have tons of questions about how use-castes work in the Stillness — is there any chance you could do a post explaining that in a bit more depth? Or is it something that you’re leaving to be explored more fully in subsequent books? It might have; the Sanzed would’ve been deliberately breeding for patterns and symmetrical markings over millennia, in order to make themselves look more fierce. Err, re. the hair, I didn’t mean that there’s anything like “ashblow” hair in Davenport’s novel, just a female protagonist who is very tall and whose hair goes bone-white when she is older (the shark shapeshifter). Ah. Yeah, if they were going for intricacy and actual patterns instead of just letting nature take its course and make random shapes, I can see that then. Have you ever seen a really good living-statue busker? That jolt of “holy cow, that statue just moved!” is what I think of when you mention stone-eaters.